Studies show homeschooling is becoming more popular in the U.S. — a trend that West Virginia is following. Advocates are hoping bills recently introduced in the state Legislature will make homeschooling easier. 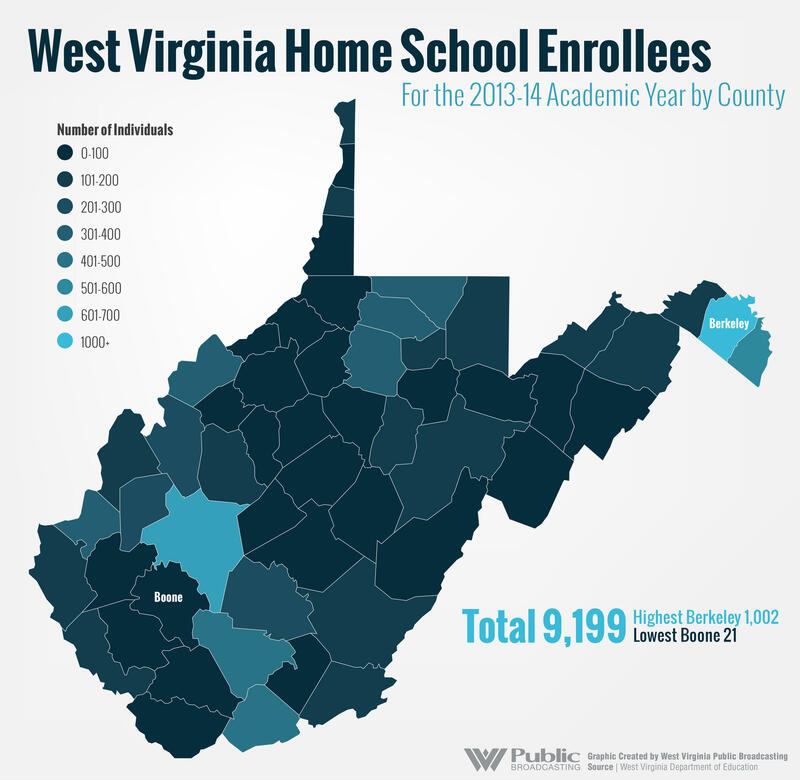 There were about 7,000 children home-schooled in West Virginia during the 2010 academic year. That number rose to about 9,000 in 2013, according to the West Virginia Department of Education. A study by the National Center for Education Statistics says almost two million children, or three and a half percent of the U.S. school-age population, were home-schooled in 2012. That’s up from about three percent in 2007. Along with that growth has come a change in how people outside the homeschool community view it, says Kathleen Guire who homeschooled all seven of her children. She is a founding member of THESIS, a faith-based homeschool group affiliated with Trinity Assembly of God, in Fairmont. Several bills that alter the way homeschooling is governed were recently introduced in the state Legislature. Much of that legislation aims to shore up parents’ authority to educate their own children and remove some layers of bureaucracy. One of the provisions in Senate Bill 444 says parents only have to declare their intent to homeschool their kids once, instead of every school year as is now the case. The bill was introduced by Sen. Robert Karnes, of Upshur County, a homeschool parent himself. I think parents deserve more credibility. Heidi Nawrocki and her husband, Dan, are secular homeschoolers who live in Lumberport. They have a five-year-old and a two-year-old. Heidi says she sees the new legislation as affirming parents’ ability to teach their own children. Daya Solomon agrees. She lives in Morgantown and homeschooled her three children. Her oldest is now 31. Her youngest is 18. "I think parents deserve more credibility." To critics who fear that parents might take advantage of less oversight, she says cheating exists in every sphere of education — fudging standardized test scores for example. 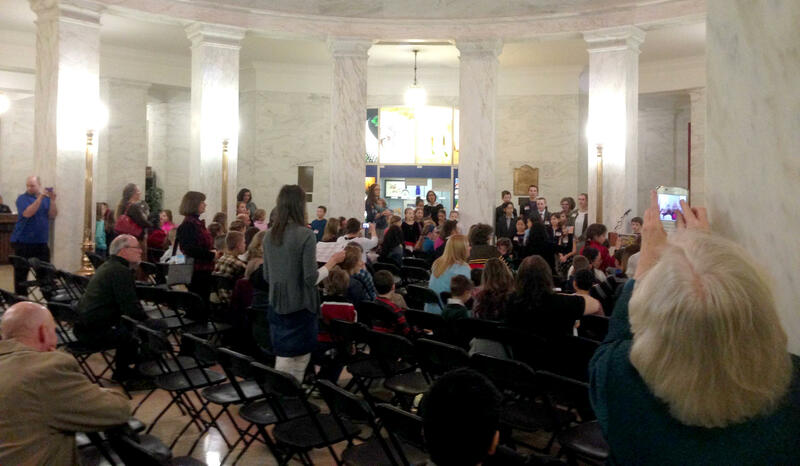 Children sing at a rally February 12 during Home School Day at the Legislature in Charleston. Senate Bill 444 has a companion bill in the House, House Bill 2793. Among other things, the bills drop the requirement that homeschool providers have a GED or high school diploma. They also require counties to accept parent-administered standardized test scores. Morgantown resident and homeschooler Grace Ayscue has some reservations about the new legislation. She has two boys, one in middle school and one who just finished high school. Ayscue worries that the new laws will move homeschooling further away from the mainstream. She says there are many ways to homeschool and she wants to keep options open for people like herself, who send their kids to public school part time. According to the West Virginia Home Educators Association, House Bill 2793 is up for consideration Wednesday.